It doesn’t take much to change a foundational teaching on horsemanship. Make a small omission, teach a slightly different definition, distort a concept or tool; and then pass it on to the current generation, and horsemanship evolves. The study of horsemanship at the Fort Riley Cavalry School was based on the theories of riding from the French Cavalry School, the Italian (Caprilli) method, and other European Schools. The Fort Riley Cavalry School became a think tank that caused a purposeful evolution of jumping horsemanship in America that has been hugely beneficial to the modern horseman. Further evolution of horsemanship is unavoidable as the purpose for the horse changes, alongside the interest of equestrians. But sometimes evolution that is intended to be helpful has unforeseen harmful effects. Directly connected to all good horsemanship is the definition of the base of support. The understanding and development of a good base of support in the jumping venues directly influences the rider’s balance, and consequently their ability to be in balance with the horse over fences. It also effects the type of release a rider will use during jumping. Since the days of the Fort Riley Cavalry School, the definition of the base of support has undergone changes, helping to create a symbiotic need for the crest release. This description of base of support is in agreement with the writings of Lt. Col. Harry D. Chamberlin in Riding and Schooling Horses, 1934, and seems to have been the consensus in other writings of this time, such as, Riding, the Balanced Seat, by Benjamin Lewis, 1936. 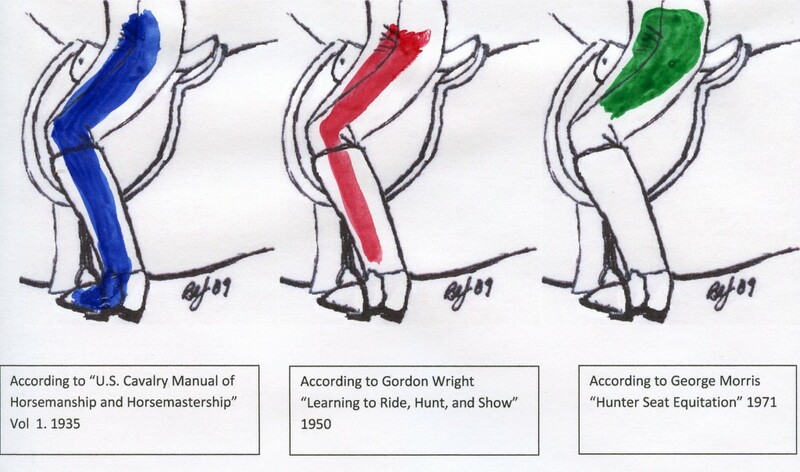 In 1950 we encounter a change when former Cavalry instructor, Gordon Wright, omits the stirrup as part of the base or base of support in his book Learning to Ride, Hunt and Show, (page 14). Later in his version of the Cavalry Manual of Horsemanship and Horsemastership 1961, Wright changes the Cavalry’s definition of the base of support. He writes,pg. 23, “(b) the base of support is formed by those parts of the rider’s body in contact with the saddle and the horse, from the points of the buttocks down along the inside of the thighs, to and including the inner knees and legs.” Wright changes the Cavalry’s ‘point of pelvic bones’ to point of buttock (which is not the same thing) and he omits the stirrups from the Cavalry’s description. In 1971,l Gordon Wright’s protege’, George Morris made an even larger change to the definition of base of support in his “Hunter Seat Equitation” when he refers ( on page 8 ) to the base of support as the thighs and seat. Not only does Mr. Morris omit the knee, leg, and stirrup from the original definition, he also blurs the points of the pelvic bones into a general term, seat. March, May and June of 2009, in his monthly “Practical Horseman” column, “Jumping Clinic with George Morris”, Mr. Morris refers to the base of support as being the seat and thigh. He refers to the rider’s base as being “too high out of the saddle” , “behind the horse”, “ahead of the horse”, or “just right”. Certainly by his description , Mr. Morris destroys his own definition of base of support since, if the base of support no longer supports the rider, it ceases to exist. Why Didn’t You Say That in the First Place? Mr. Morris’ April 2009 column in “Practical Horseman”, is titled “The Stirrup as the Foundation”. Here we see that even though Gordon Wright removed the stirrup as part of his definition of the base, George Morris still considers it a foundation. The American Heritage Dictionary’s #2 definition of foundation is, “The basis on which a thing stands, is founded, or is supported.” Or more simply stated “The base of support”. Short cutting any foundational teaching in horsemanship is sure to have its price. In a later blog I’ll show you that the cost for cutting out half of the definition of the base of support in riding, has been an increased dependency on and a validation of the crest release. The crest release is placing the hands on the horse’s neck (crest) in order to support your upper body over the jump as opposed the automatic release which occurs when the rider allows the hands to follow the horse’s mouth, with a straight line from elbow through hands to bit, with out leaning on the horse with the hands. In his 1950 book, “Learning to Ride, Hunt and Show”, Gordon Wright teaches the beginner, who is just learning to trot, to put his hands halfway up the crest, in the mane and to put the weight of his upper body on the hands and the horse’s neck. Gordon Wright teaches that leaning the upper body on the hands is the correct jumping technique for the beginner and intermediate rider, but that advanced riders should strive to “jump out of hand” which is another term for automatic release. George Morris, a student of Gordon Wright’s, teaches a short and long crest release. These are named for how far up the neck the rider places his hands. In both cases he tells riders to support their upper body with their hands. Both of these releases are currently considered the “norm” for the American Hunter and Equitation show rings. Which one is used depends on the level of rider. Thanks for your comment and thank you very much for reading the US Horsemanship blog. I never teach the crest release as supporting the rider’s body. I always emphasize that the crest release is for novice riders to steady their hands and prevent pulling or jabbing the horse in the mouth if a horse leaves long or over-jumps. The body should never be supported by the hands because that will throw off the balance of the horse. Just the weight of the hands presses into the neck to prevent the hands floating and an unintentional pull on the reins. The release must be long enough to allow the horse to use his head and neck without interference.